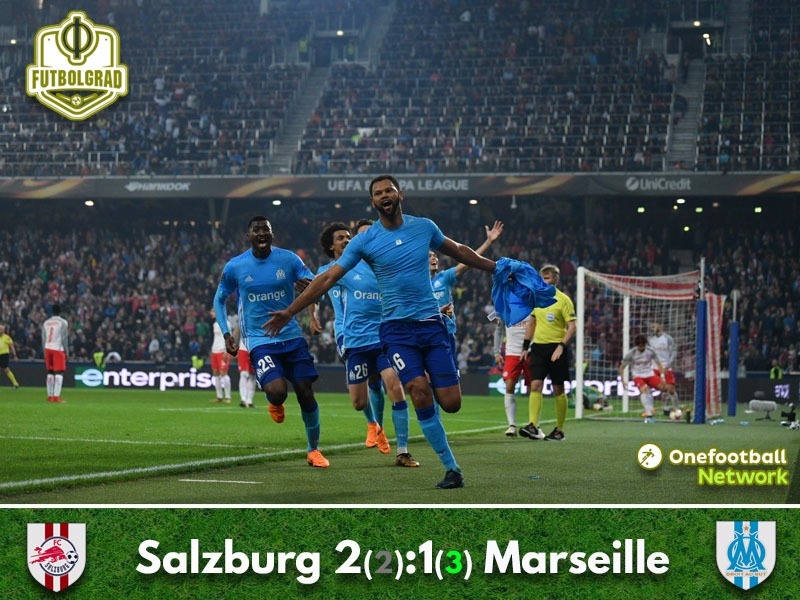 Salzburg v Marseille was a thrilling encounter that had to be settled in extra-time in which Marseille got the winner after a very controversial corner kick. The match had a firey beginning with Marseille fans lighting up a massive firework ahead of the match. On the pitch the game also started with fireworks and Marseille had the first chance within six minutes with Dimitri Payet bringing a freekick from the right flank dangerously close in front of the net but Lucas Ocampo, Florian Thauvin and Adil Rami all sail past the ball. Salzburg, in turn, had their first chance in the 13th minute, with Munas Dabbur tanking through the centre and then unleashing a shot that was poorly handled by Yohann Pelé and his backline had to do well to clear the situation. The game remained full of energy with both teams pressing aggressively trying to find space gain an advantage. Salzburg, in particular, were pressing playing an impressive, dominant style with, which they tried to dissect Marseille’s defence. Although attractive to watch OM was able to hold down the fort suppressing Salzburg’s attacks. Marseille got away with the minimum in the first half. Sitting deep the French side were looking for the break that could decide the tie. As a result, it was a first half in which Salzburg were the more dominant side without getting into the sort of areas where they could threaten the French. Salzburg needed a goal to get into this match, and in the 53rd minute, it finally arrived. Amadou Haidara won the ball in midfield and slalomed through Marseille’s defence and then unleashed a shot with the outside of his foot that left Pelé dumbfounded. The goal woke Salzburg up and caused insecurity in Marseille’s backline, which was evident in the 58th minute when Ramalho unleashed a shot from 30-yards that was poorly handled by Pelé. Salzburg at this point were unbelievably strong. Die Roten Bullen had Marseille on the back foot playing the typical Red Bull brand of football – hard, aggressive, without compromise and technical elements. In the 65th minute, the second goal arrived. Haidara broke through on the right, and his cross eventually found Xaver Schlager, whose shot was deflected by Bouna Sarr to beat Pelé. Marseille now had to open up to score to prevent extra-time. As a result, Salzburg now had room to counter and thanks to Hee-Chan Hwang, who came on in the 68th the perfect outlet for quick counters. Marseille, in the meantime, were without an idea but should have been awarded a penalty in the 86th minute after Duje Ćaleta-Car handled the ball in the penalty box, but referee Sergei Karasev waved play on. 90 minutes ended, and Salzburg were up 2-0. At that point, Atlético Madrid had already booked their ticket and Marseille came close to making a big step towards Lyon straight after kickoff with André Zambo missing the target from 16-yards out. Salzburg hit back in the 98th minute with Pelé pulling off a monster save after a close-range Ćaleta-Car header following a Salzburg corner. Salzburg had chances but did not convert with Dabbur wasting the next great opportunity in the 101st minute failing to hit the net, after Takumi Minamino had set the striker in scene with a great pass, with a shot from about 18-yards out. With everything on the line, both sides risked very little in the second half of extra-time, and everything pointed towards the match heading to penalties. Then in the 116th minute, Marseille was given a corner kick after a French player had deflected the ball over the byline. Payet brought in the ensuing corner, and Rolando got a touch on the ball in the centre to deflect the ball past Alexander Walke in what was the winning goal of the tie. A few moments later Haidara was sent off after a foul against Payet. It was the final nail in the coffin for die Roten Bullen, who were the better team that evening but had a crucial decision go against them, which cost them the final in Lyon. 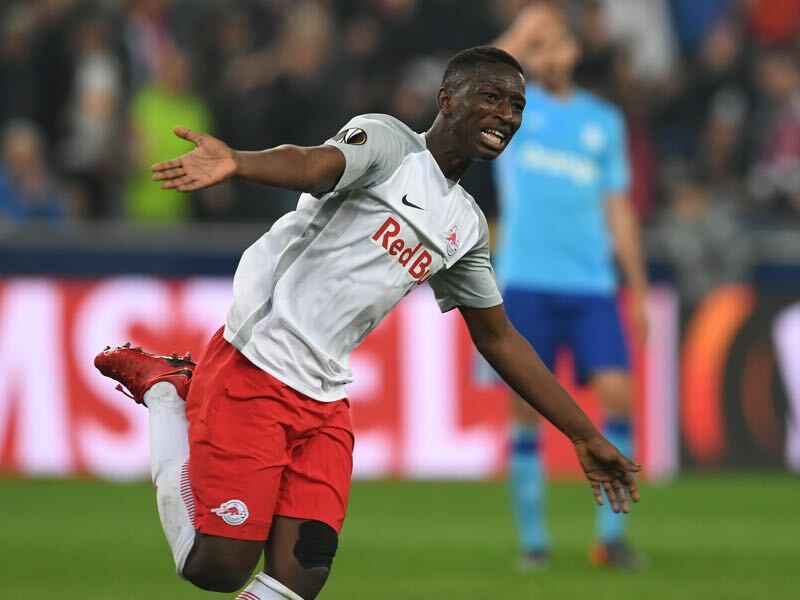 Amadou Haidara may have been sent off in extra-time, but at that point, emotions were already boiling after Salzburg had a poor call go against them. Before that moment, Haidara was without a doubt the best player on the field by dominating all over the pitch. The midfielder at times sliced Marseille apart at times highlighting why he is one of the hottest prospects in European football at the moment. Another semi-final in a European competition another refereeing mistake that made the difference. Players should decide games and not referees, and Karasev was overwhelmed with the occasion. To make matters worse there is a technology available that could clear up controversial decisions. Andreas Ulmer played his 20th match in Europe this season, which is a new single-season record. Although Marseille won the overall tie, Salzburg are now unbeaten for 11 matches in a row at home. It has been 22 years since an Austrian team reached the final of a European competition and sadly that wait will continue.